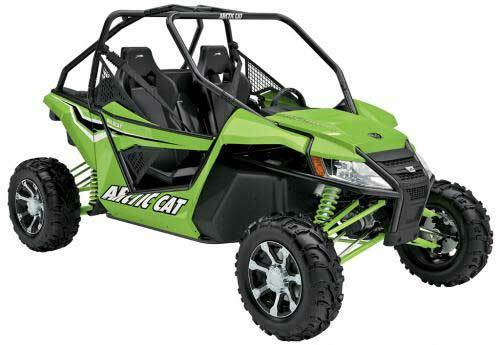 The 2012 Arctic Cat Wildcat is for real! After many rumors and much speculation, Arctic Cat has pulled the trigger on this cutting edge side by side sports UTV. Actually, Arctic Cat refers to the new machine as an ROV (Recreational Offroad Vehicle). If it wasn't obvious from the photo below, there is no hint of utility anywhere on the Wildcat. The Spec sheet confirms this ride is all about the performance! The Wildcat has a 1000 class fuel injected engine, 13 inches of ground clearance, and 18 inches of wheel travel for starters. The new Arctic Cat side by side sports UTV - Wildcat. It looks like Arctic Cat has really committed to building an all out, pure sports, side by side. There has never been a production UTV model that looks as race ready on the showroom floor as does the Wildcat. I believe the Polaris RZR XP900 has some serious competition now. So let's take a more in depth look at this newest entry in the side by side wars. We'll break it down by the main components to see what's under the skin of this Wildcat. 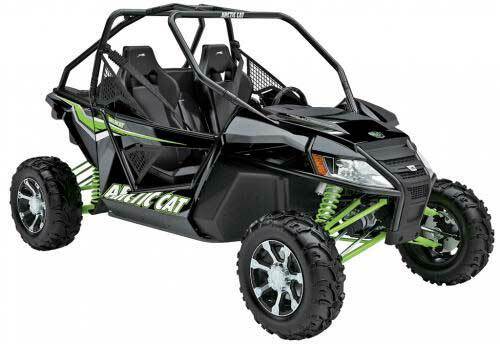 Arctic Cat Wildcat 1000i H.O. Features. The basic building block of any machine is the frame. The Wildcat breaks some new ground with a very racy looking, Baja Buggy type perimeter frame. Also called an Exoskeleton frame since some of the frame and roll cage extend outside the body panels. This frame is designed to keep the heavy bits as low as possible (including the driver and passenger) for a low center of gravity. The roll cage protection looks much more serious than any previous vehicle in this class. Very similar to the hand built racing buggies that sell for twice as much. It may be a little harder to get in and out, but that's something I will gladly sacrifice for the added protection in a machine with this much potential performance. A conventional double A-arm front suspension has an unconventional 17 inches of wheel travel. Just the most of any production side by side as of today. Arctic Cat didn't scrimp on shocks either. The Walker Evans Racing billet aluminum units come with remote reservoirs and 17 position dampening adjustments. They're wrapped with dual rate coil springs and pre-load adjusters. The rear is controlled by a new 5 point multi-link trailing arm style suspension. Once again, this is some big time racing hardware! Walker Evans shocks keep control of the 18 inches of wheel travel. All that first class suspension is connected to 14 inch alloy wheels and Duro tires developed to work exclusively with the Arctic Cat Wildcat. The first class hardware, the low center of gravity, and an ideal 40/60 front to rear weight bias should add up to best in class handling. With the premium specs of the frame and suspension, you kind of knew that they weren't going to scrimp on the engine. And you would be right. The 1000 class V-twin comes from the Prowler but with a few tricks. Bigger throttle bodies, a new tuned air intake system, and exotic ceramic coated 2 into 1 exhaust up the power from Prowler levels. In the Arctic Cat Wildcat, it's also liquid cooled and electrically fuel injected for the record. Conventional automatic CVT much like the Arctic Cat Prowler. The Wildcat does get the SLD (Spike Load Dampener) which should improve driveline reliability. You get the standard console shifter with Hi-Low range, neutral, and reverse. The dash mounted switch for selecting 2 or 4 wheel drive and the diff lock will look familiar to Prowler owners. Brakes are the expected 4 wheel disc which will probably get a work out on this Arctic Cat Wildcat ROV. The hits keep on coming with racy high back bucket seats that look like the best aftermarket units. Seat belts are 3 point with an anti-cinch design for comfort and security. You even get some cool tube frame doors that have integrated side nets for even more protection. Just to be different, they pivot at the rear and latch at the front in an old school suicide style. What's not old school is the unique 5 inch diameter digital/analog round gauge that can monitor 14 different operations. It's mounted in the center of the dash, so you can't lie to your passenger about the readouts. A locking glove box and dual cup holders are included just because Arctic Cat wants to. We saved the best for last because the Arctic Cat Wildcat comes with ... wait for it ... Electric Power Steering! That's right, another industry first! No more getting the steering wheel jerked out of your hands in 4wd. Or feeling like you wrestled a bear after a long day in the seat. An infinitely adjustable tilt steering column adds to the fun. Black Metallic and Arctic Green Metallic are the available Wildcat colors. Like this thing doesn't have enough features - here are a few more. LED head and tail lights. Twice as bright as halogen at half the wattage used. Rear cargo box with 300 pound capacity for coolers and spare fuel. 12 volt accessory outlet in center console. HDPE full protection skid plates. Arctic Cat says there will be more than 50 custom accessories developed specifically for the Wildcat. You shouldn't have any trouble personalizing one with all that to choose from. A complete line of lightweight aluminum pieces will be featured. Included will be easy to install front and rear bumpers, rock sliders, a-arm guards, and skid plates. Contoured windshields with integrated dust management improve comfort, while a t-top style roof with a built in headliner gives you a place to mount your tunes. Other more practical goodies will include gas can and cooler holders, spare tire carrier, and a cover for the rear cargo box. You can even get fender flares for an even wilder looking Wildcat! We haven't heard a firm price yet, but the rumor mill is saying between 15k and 16k. If that ends up being any where near true, Arctic Cat better get ready to pay some overtime at the factory! Current base price is $16,999. Return to Arctic Cat ATV from Arctic Cat Wildcat. UTV Guide - Guide to all the most popular UTVs.